After spending what felt like 24 hours traveling — 3 hours at JFK, 11 hour flight to Cairo, 4 hour layover in Cairo, then 1.5 hour flight to Amman, we pulled into our hotel last night around 8:30 p.m. local time. 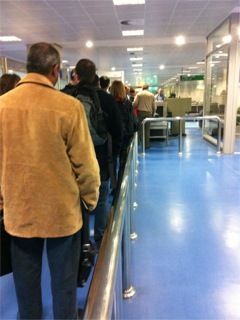 Yeah — travel really is all glamour! 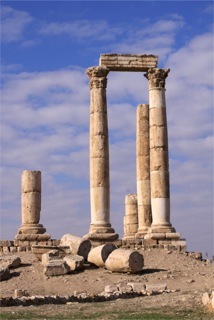 We got up early and started our first day in Jordan with a trip to the Citadel, located roughly in the center of town. Amman is not an ancient city, our guide tells us many times that it was mostly farm land up until about 40 years ago and its been growing exponentially ever since. The current population of Jordan is about 6,000,000, half of those live in Amman. But, people have lived in the surrounding area for thousands of years. The citadel is a walled fortress that contains enough ruins to keep archeologists busy for decades. Perched high on a hill is Hercules Temple. Mostly dismantled (the stones were used for other building projects) but nonetheless stunning. We visited the charming little museum built by the British during their “mandate” which was 1919-1946 (I’m not sure what the difference is between a mandate and an occupation). 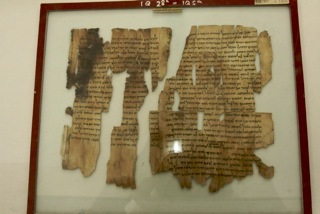 Among the many ancient pots, sculptures, and jewelry were some of the Dead Sea Scrolls. All of the labels are still the originals typed on a manual typewriter with clearly corrected mistakes. It doesn’t look like anything has changed in the museum since 1946. In town, we visited a Roman amphitheater, as the Romans were in charge here after the Persians, from about 660 BC to 63 BC. Our guide tells us some of the best Roman ruins in the world are in Jordan — tomorrow he’s taking us to the Pompeii of the Arab world. Just 30 or so years ago the amphitheater was surrounded by farms, in fact they were farming right in the floor. It holds 6,000 people and is currently used as a theater several times a year. The stage had to be rebuilt and some of the seats after the big earthquake of 1927, but it’s amazing how in tact it is. 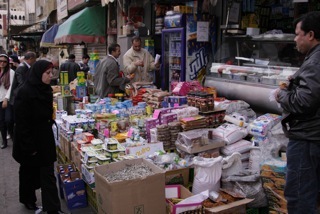 We walked through the Souk, or market, which was bustling. Friday is the sabbath day here so many of the shops were closed but the produce market was busy. Then we headed to the Dead Sea for lunch and a swim. We were able to look across the lake and see Jerusalem and Jericho. Driving through what has traditionally been a very fertile valley, we saw fields covered with banana trees, tomatoes, corn, sheep, a few camels, horses, burros and a lot of families have roadside picnics. Water is in short supply so this once abundant breadbasket is in trouble. Our last stop was at the Holy Land sweet shop. We had a not-so-sweet delicacy of goat cheese, honey, shredded wheat and pistachios. Yummy! Barnaby and I arrived in New York a few days ago. We’re on our way to Egypt and Jordan, and are happily breaking up the long flights with a few days in New York at both ends of the trip. We were very lucky to arrive after the big Christmas blizzard and are enjoying relatively balmy weather for this time of year. There’s still snow piled up in the street but the temperatures have been in the 30s and 40s — very pleasant for walking. Our friends Dave and Carolyn from Tucson joined us for a couple of days. We all fly to Amman tomorrow and meet up with the rest of our group. 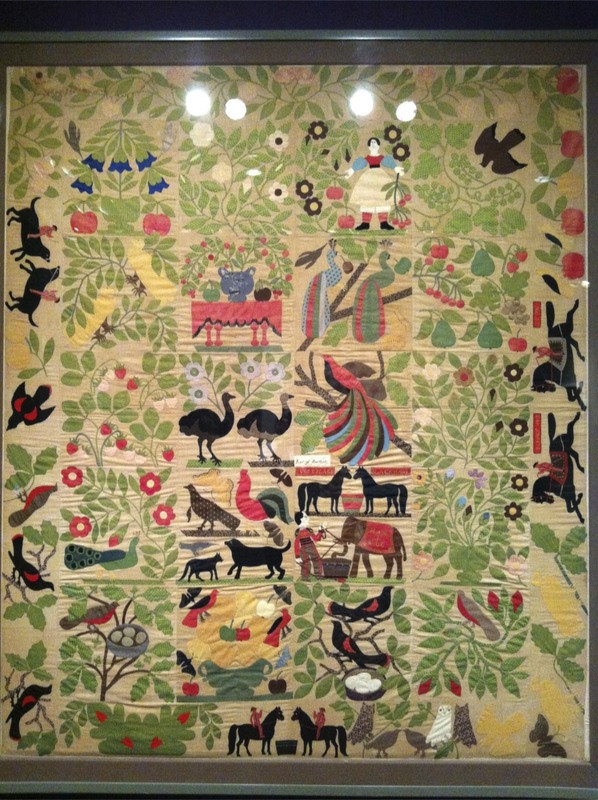 Carolyn is an avid quilter so she and I spent the afternoon at the American Folk Art Museum enjoying their current quilt show. I learned so much from Carolyn and have an even greater appreciation for this special art form. 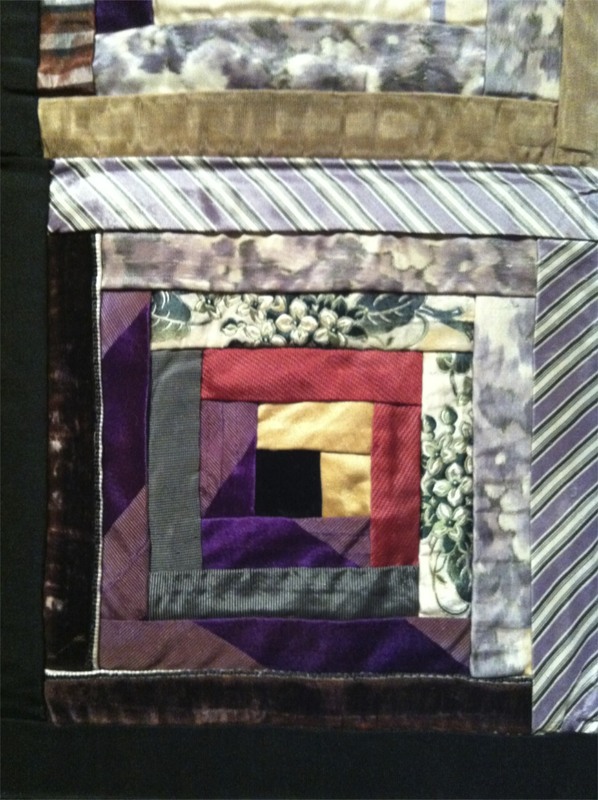 This quilt isn’t complete: it’s a quilt top (it doesn’t have the batting or middle layer, or the backing — so it hasn’t actually been “quilted’), perhaps because it was made in anticipation of a wedding that did not take place. Notice there’s no man next to the woman at the top. It contains many symbols of fertility: the pairs of animals, the nesting birds, and fruit and flowers. 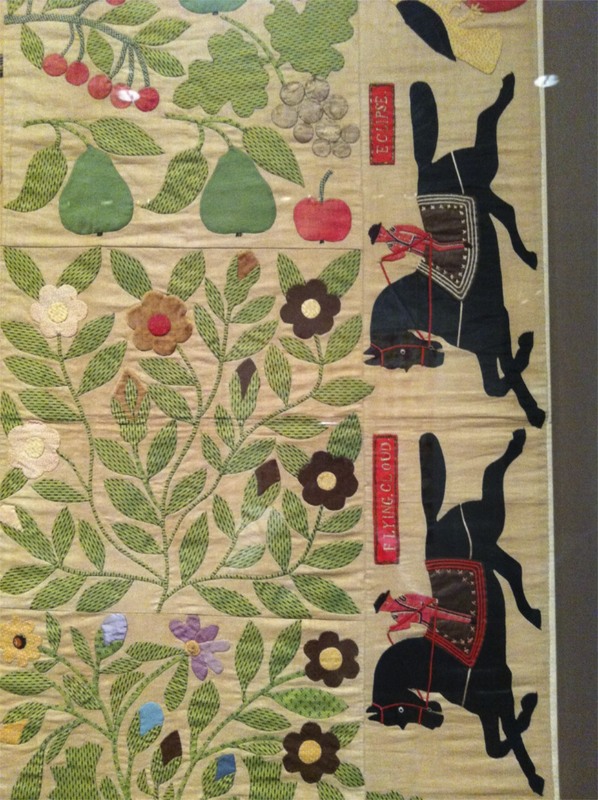 From 1860 to 1863 local ads advertised Hannibal the elephant (identified here as “Hanibal”), as performing in traveling circuses in New York City and throughout the Hudson Valley, so the quilt is thought to have come from Albany, New York, and is dated 1858 – 1863. Another of my favorites is this beauty by Isabell Bester. Strip piecing is a primary construction technique in West African and Caribbean textiles. 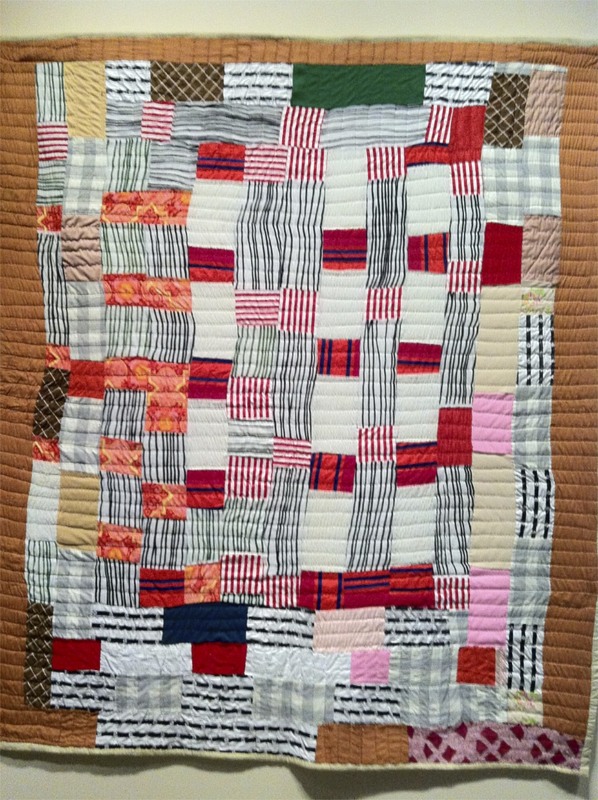 I admit I am drawn to the less traditional quilts — though they are all quite stunning. Here’s a photo of Carolyn. 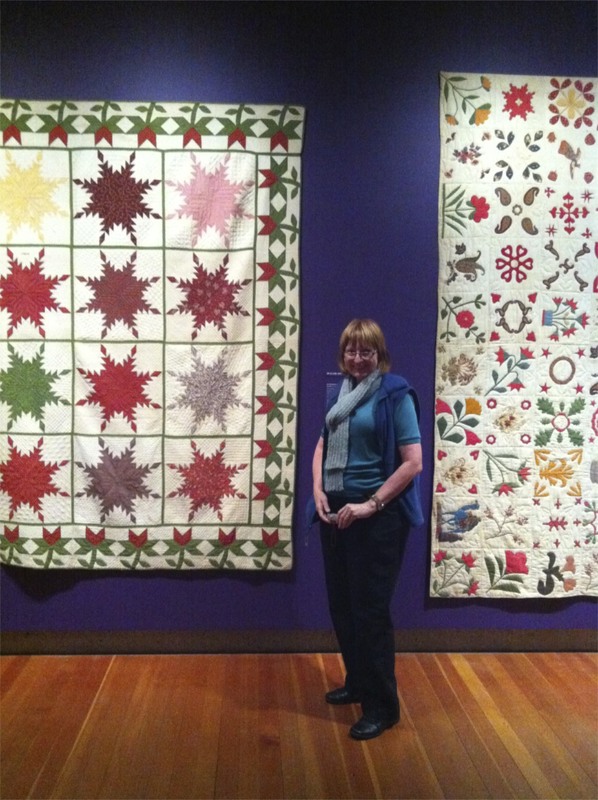 Notice the size of the quilts. Except for a couple crib quilts they were all large. I’m sorry my photos aren’t in better focus — they were all taken with my iPhone using no flash. Okay — one more. 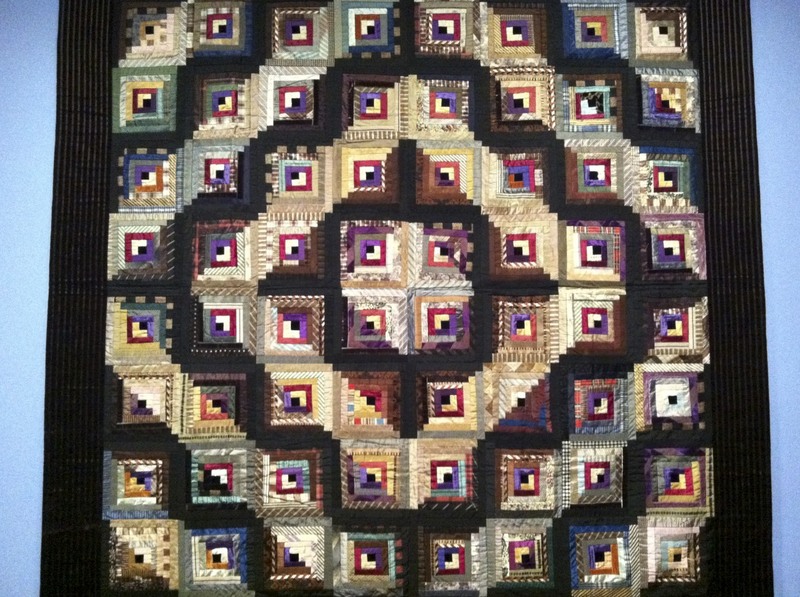 This is a Log Cabin Quilt, Barn Raising Variation from Connecticut 1875 – 1885. This one is made of silk and was probably intended for decorative use and removed from the bed before sleeping. The detail was spectacular. 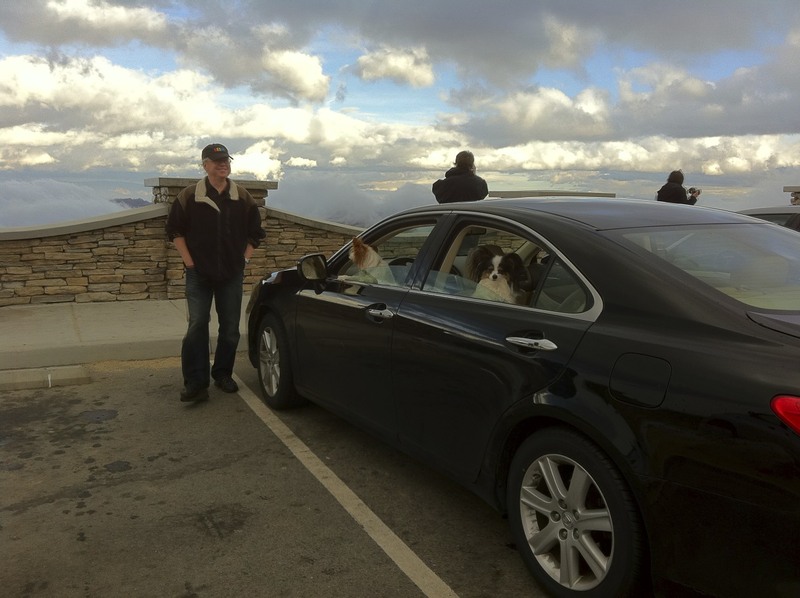 Since I miss my dogs already, here’s a photo I took last week on our drive down to Palm Desert the day after Christmas. 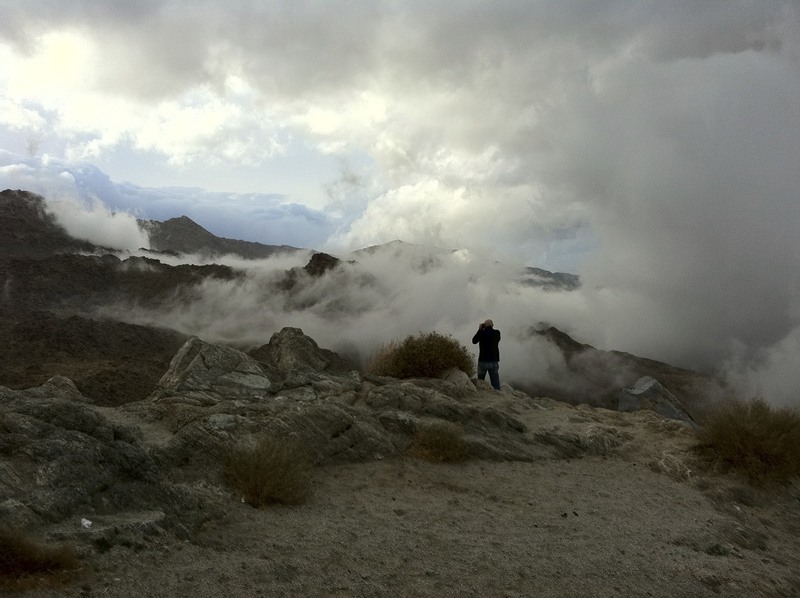 The desert was completely socked in with clouds — a sight I have never seen before. We stopped at a view-point and I took a couple of photos.